Today we’re very pleased to make our new version of Collections Online available. We’ve made it work much better on your smartphone or tablet, while still being really useful on desktop for more in-depth research. We’ve also made the images much bigger, search results clearer, and made it easier for you to follow your own path to objects you may not have expected. We hope we’ve also made it a bit easier to share on Facebook, Twitter, or your other favourite place to be. 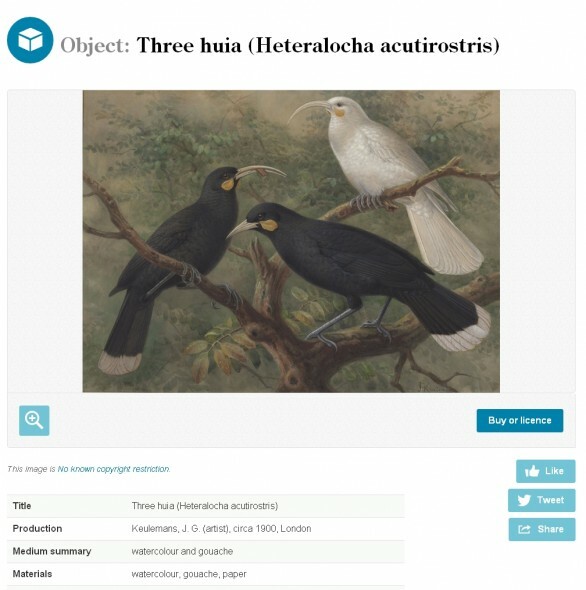 If you haven’t seen Collections Online before, it’s a great place to find the items we have in our varied collections, from art to Asplenium, from fish to things made of fish, dinosaurs to, uh, dinosaurs… anyway there are over 500,000 objects including art, photography, archives, Pacific, Taonga Maori, history, zoology to botany, as well as lots of information about your favourite artist, explorer, place, material, technique or species and much more. Plus, there are over 150,000 images, many of which are very zoomable. Feel free to launch right in and search for your favourite collection object, person or place (or pick a random object). If you’re not sure where to start, maybe explore some of our subject areas. We’ve been working on this for a while now, and we think it’s pretty good, though it might still have the odd rough edge here and there. If you find any issues let us know here, we’d really appreciate your feedback. Take a look around, and stay tuned for some other big news in the near future that should make your collections even more accessible and usable.